Masks, grapple-guns, static boots, retractable membranes, ring-radios? Check. Supervillains with names like The Golden Claw, The Electric Eel and Diablo? Check. Okay then, tune your podcatcher to ‘pure pulp’ and break out the hockey organ because The Red Panda Adventures – Season One is ready to glide into justice. This first 12 episode season is full of flying kung fu fists, mesmerizing hypnosis, snappy dialog and mystery. Most memorable for me are the characters and the dialogue. Plot lines are reminiscent of comic-book and radio serials from yesteryear but the parlance is all modernistic as filtered through a roaring-twenties speech pattern paradigm. Episode 2: Night Mission and Episode: 7 Red Panda Wanted Dead Or Alive stood-out because these episodes highlighted the interaction between the love-blind hero, Red Panda, and his adoring sidekick The Flying Squirrel. The Panda’s superpowers are a cross between those of The Green Hornet and The Shadow. He’s a master hypnotist, able to cloud the minds of villains. Other fun aspects are the introduction of other superheroes and superhero groups, in a way the whole show reminds me of animated version of The Tick if it were played slightly straighter. The Red Panda Adventures – Season One is a super-fun diversion delivered in delicious half-hour doses. 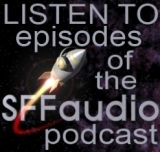 The only thing better than the production of this fab audio drama series is the vocal talent. I get endless kicks out of the sexual tension between the oblivious Red Panda and his pining sidekick/driver Kit Baxter. Their city, 1930s Toronto, is quieter than many other audio dramas, I hear less foley and fewer sound effects, I like that they aren’t obsessed with putting in the sound of footsteps in every scene – it usually isn’t necessary. Also nice is that from episode one of this series this show really works. This is probably because of the experience gained during the previous Red Panda incarnation (a six episode series set during WWII). Season Two is already underway and I look forward to devouring it too. Awesome classic style radio adventure! Wildside Press creates "Wildside Audio Library"
The Time Traveler Show Podcast # 10 Asimov on "Utopian Change"